Beautifying and enhancing the functionality of any outdoor space is normally a tough job. However, it can be made easy through the right design methods, building techniques, and materials. And one way to ensure that your property in Ripon, Modesto, or Turlock, CA will easily stand out both in its practicality and aesthetic appeal is to use premium pavers from trusted suppliers. At Gilgert’s Landscaping, we take pride in our solid record of designing and creating landscape features using the finest quality pavers available. 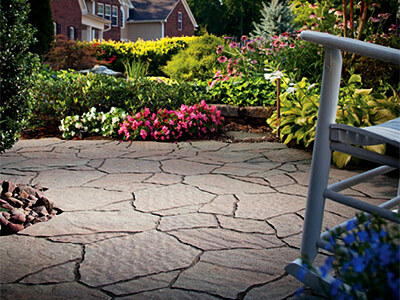 We carry products from industry leaders, such as Basalite and Belgard. With their various paver lines, we are able to satisfy our clients’ design requirements and transform their ideas into actual outdoor features that are as functional as they are stunning. Mega-Arbel. This paver line features interlocking design that allows for easy installation and snug fit. It also mimics nature’s rich color, hence serving as a perfect option for the nature-loving property owner. Urbana. If you fancy the look of traditionally cut stone characterized by chiseled texture, then pick the Urbana design option. It can be configured to various shapes and patterns for total versatility and aesthetic appeal. Old World. Do you love a time-hewn look that elicits memories of old European villages and countryside manors? The Old World design will surely delight you. Its time-worn appeal, sturdy nature, and wide range of available colors and patterns make it a very attractive paving solution. Cambridge Cobble. This is perfect for walkways, patios, garden areas, and outdoor kitchens with its pillow-top texture and rounded corners. Mega-Laffitt. This modular paver line offers nature-inspired texture, design flexibility, ease of installation, and aesthetic merits similar to what a flagstone gives. We also carry products from Basalite, such as Artisan Premier, Artisan Slate, Bullnose, Italian renaissance, and San Francisco Cobblestone. Just take your pick from these available options, and we will use it to build for you the best outdoor amenities using premium quality pavers. Gilgert’s Landscaping is among the most sought-after paver installers operating in the state of California. As a professional landscaping contractor, we are known for our use of smart paving solutions. 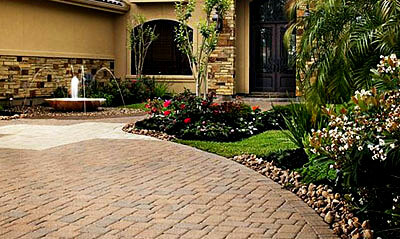 For example, we recommend permeable pavers for those who want eco-friendly products. Permeable pavements aid in surface water management, reduce irrigation demands, and lower local heat island effects. Our skilled and certified paver installers also use task-appropriate tools and equipment to perform their job efficiently and safely. Additionally, we follow a systematic installation approach to ensure timely completion of projects and guarantee positive results. No matter how simple or ambitious your dream landscape amenities may be, we can take the challenge head-on and create them using premium materials. With partners that are considered the most reliable suppliers of high quality pavers, we can easily provide your needed design or theme. And with a team of skilled landscapers working for us, we can surely build your desired landscape features in the shortest time possible. Call us today for more information on our offered paver installation services. We service Ripon, Turlock, Modesto, and several other California cities.